• Chromed Zinc Allow Handles with Comfortable Rubber Grip. ➥ Super grade stainless steel upper and lower blades for precision cutting up to 5/16 inches. 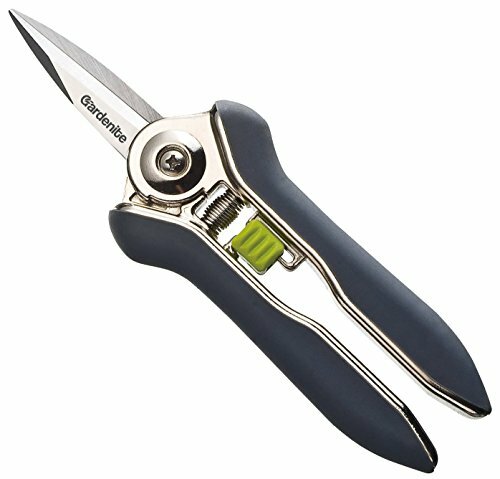 The UltraSnip is designed for deadheading, pruning flowers, pruning small plants and shrubs and other light trimming duties. ➥ Long 6.7 inch handes offer easy grip and reduce hand strain. ➥ Ultra smooth chromed carbon steel spring designed to gently open blades after each cut to reduce hand strain. ➥ 100% CUSTOMER SATISFACTION GUARANTEE - Backed by the trusted Gardenite 100% customer satisfaction guarantee. If you are not happy with the pruner we will ALWAYS refund your purchase!